The Wisconsin rental agreements are documents used for the binding arrangement between a lessor and lessee for the use of residential or commercial property in return for payment. All forms must be used pursuant to Chapter 704 (Landlord & Tenant) and upon the authorization of both parties the contracts become legally binding. 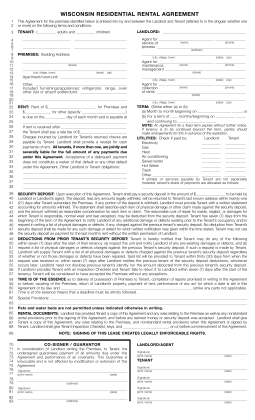 Rental Application (Realtor Version) – For the use of a landlord to verify that a tenant is employed, has decent credit, and that their background is clean. Association of Realtors – Provided by the Wisconsin Association of Realtors for standard residential tenancies. Commercial Lease Agreement – Contract intended or a business-related use such as a retail store, office (professional use), or as industrial (warehouse/storage). Not for the use of livable conditions. Lease with Option to Purchase Agreement – Residential tenancy that gives the right to buy the space/property to the tenant. Month to Month Lease Agreement (§ 704.19) – An arrangement where the tenant pays the landlord on a monthly basis with no set end date. Rather, the form is cancelled by notice to the other party of at least twenty-eight (28) days. Room Rental (Roommate) Agreement – A situation with more than one (1) person occupying the same home and the document establishes the rules for common areas, chores, and general terms for the property. Standard Residential Lease Agreement – Usually a one (1) year lease but a contract with a specified start and end date. Sublease Agreement – A tenant who decides to rent their space to another individual. Also known as ‘subletting’, the original tenant’s master lease must allow for this use or else the landlord’s written consent must be granted. Termination Lease Letter (28-Day Notice) – § 704.19 provides that at least twenty-eight (28) days be given before cancelling a month-to-month tenancy. 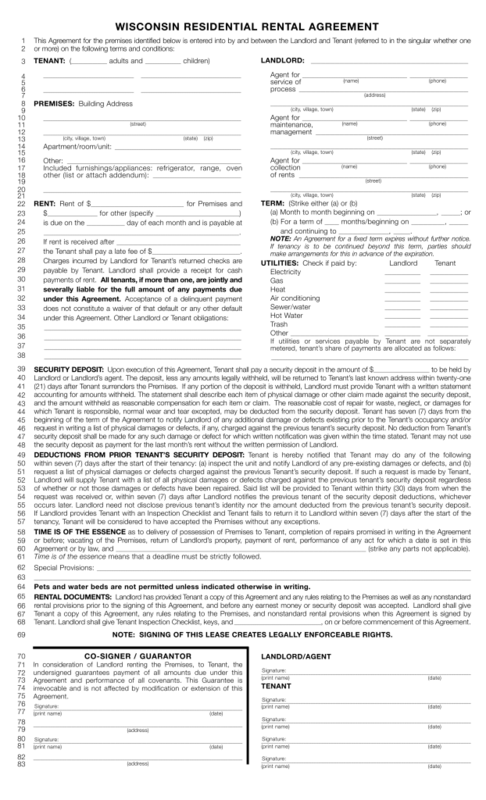 Agent/Landlord Identification (§ 134.04) – All persons allowed on the premises and/or allowed to collect rent must be listed in the rental contract along with an address for official notices. Lead-Based Paint – Required via federal law for any housing unit built prior to 1978. Move-in Checklist (§ 134.06) – The landlord must notify the tenant in writing within seven (7) days of the initial tenancy that they are entitled to go through the premises for their own inspection of any pre-existing conditions. Furthermore, the landlord must also let the tenant know that they have the right to view the previous tenant’s list of charges deducted from their security deposit upon their move-out. Water/Heat/Electricity (§ 134.04(3)) – If the rent does not include water, heat, or electricity it must specifically be written in the lease. According to § 704.05(2) the landlord may enter the premises at reasonable times with advanced notice. Advanced notice is not defined in any set amount. Returning (§ 134.06) – Within twenty-one (21) days of the tenant moving out the landlord must give the funds associated with the deposit back to the tenant.